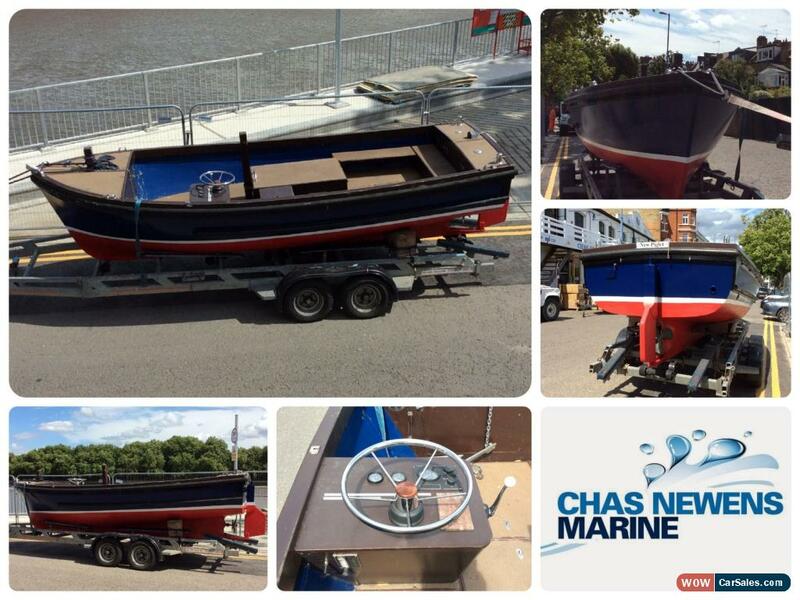 This is a superb Nelson Open Launch ideal for fishing, fun and leisure or ferrying passengers. It is 5.65m long, with a 1.80m beam, and a 70cm draft. These boats crop up from time to time, less often than others, so they are quite rare. It's a lovely little boat and the Nelson 18 is supposed to handle chop very well. It is a GRP boat with a displacement hull and a 3 cylinder Volvo Diesel inboard engine (model 2003) approx 28 HP and full steering. The hull was built at Tylers of Tonbridge who had the licence to build this Nelson Hull. The wood trim is all made from Iroko which is a very hard tough wood. It was fitted out in Reading and has spent its life on the Upper Thames, having never seen salt water. It is in superb condition and would make a very safe family boat as it is high sided,the distance from the floor to the side gunnel is approx 53 cms. There is also a navy blue overall cover with its own rod system included in the sale. The trailer is not included BUT we may be able to do a delivery to you on it.